Venture into the city or hang around the airport eating expensive junk food…? That’s always a tough decision to make. 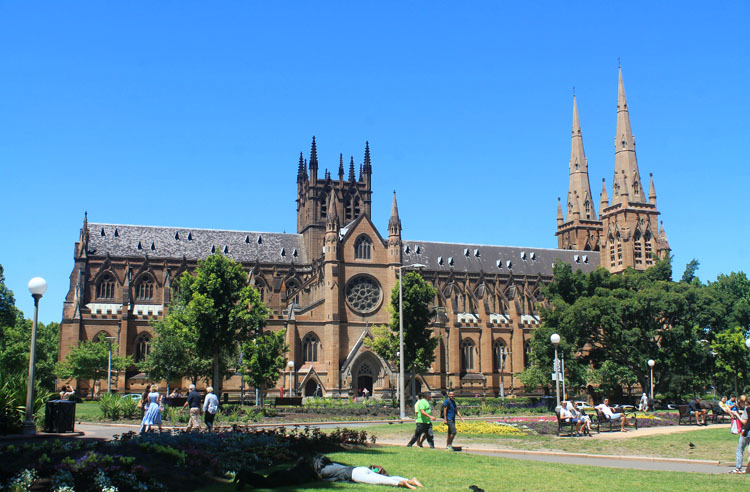 On a recent 12 hour stopover in Sydney I decided to make the most of a sunny spring day and explore central Sydney. 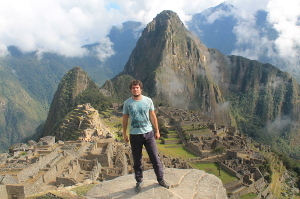 Thinking of doing the same but don’t have the budget to do it by taxi? Keep reading to find out how I saw heaps of Sydney’s inner city sights for less than $25 (including two meals). A round trip train ticket between the airport and the city will set you back over $30 AUD (most of that is made up of a ridiculous “Gate Pass”). It’s easy to get around this though, assuming you’re up for a 20-25 minute walk. Wolli Creek Station is where you want to head — from there you can get into the city and back for $10.40. To get there, turn right when you exit the international terminal and then head left just before the Rydges Hotel. It’s easy to find if you know the general direction, so load it up on Google Maps if you can. 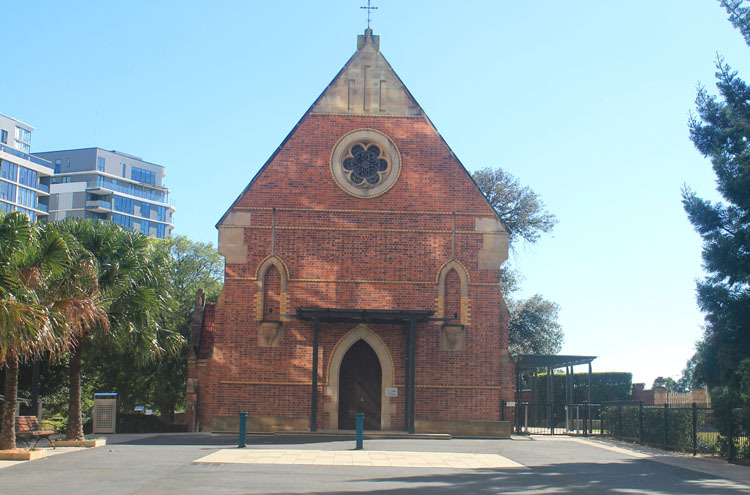 You need to walk across a bridge and from there head across Cahill Park, turn left just after the Woolworths supermarket, walk past a church (pictured below) and then up a small hill. 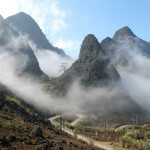 Just ask someone for directions if you feel like you’re getting lost, and ask at the airport’s information desk before you leave to make sure you start on the right track. I made it to Wolli Creek Station at around 8.45 am and tried and buy a train ticket. I had a $5 note as well as a couple of hundred dollar bills. The train ticket was $5.10, so I went to a nearby cafe to get some change. I went back to the machine and shoved in $5.20, which was immediately rejected. A sign read “exact change only”. I was willing to give the machine the extra 10c but it was obviously too proud to accept charity. If machines are ever going to take over the world they are going to need all the help they can get — leaving money on the table isn’t the way to go about it. 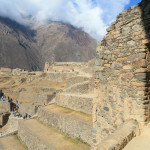 I returned to the cafe, changed my 20c coin for two 10s and a few minutes later I was on a train headed for the city. 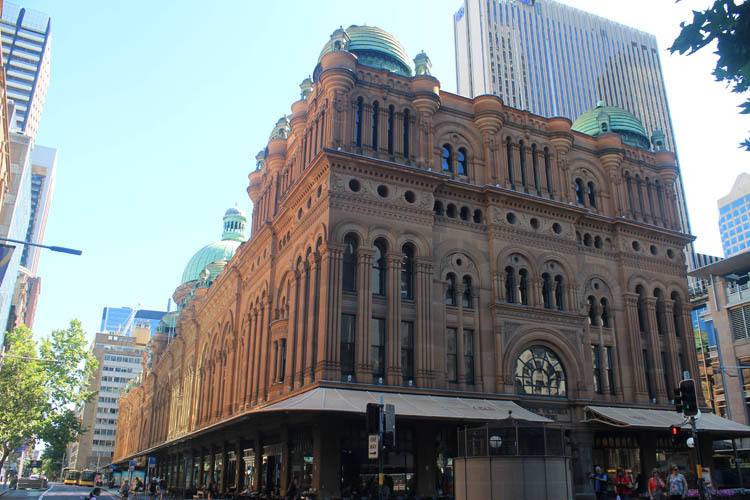 I exited Town Hall Station and was immediately greeted by some of Sydney’s grandest old buildings. 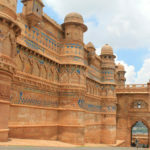 The Town Hall, built in the 1880s, is a must-see for anyone interested in colonial architecture. Like a lot of the old buildings in Sydney, the Town Hall was (mostly) made out of sandstone. 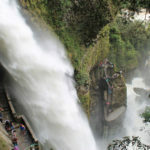 I was in the process of taking a photo when an angry voice yelled out “Be careful of my table!”. I politely explained that I was nowhere near his table (he had a little table set up full of drinks which he was selling) and that he should relax. Plenty of expletives followed. I tried to explain that he wouldn’t sell many drinks with that attitude but he didn’t want to hear it. 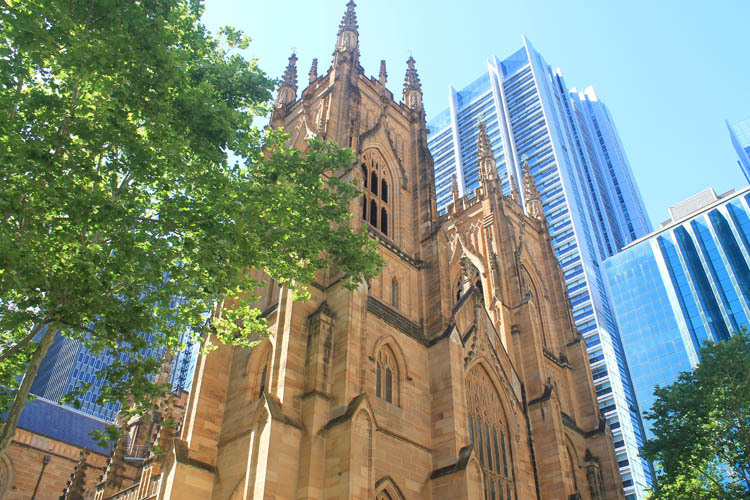 If you’re in this area also check out St Andrew’s Cathedral, it’s one of nicest churches in Sydney. I continued exploring the area around the town hall and soon ended up inside the Queen Victoria Building, which is now a shopping mall. 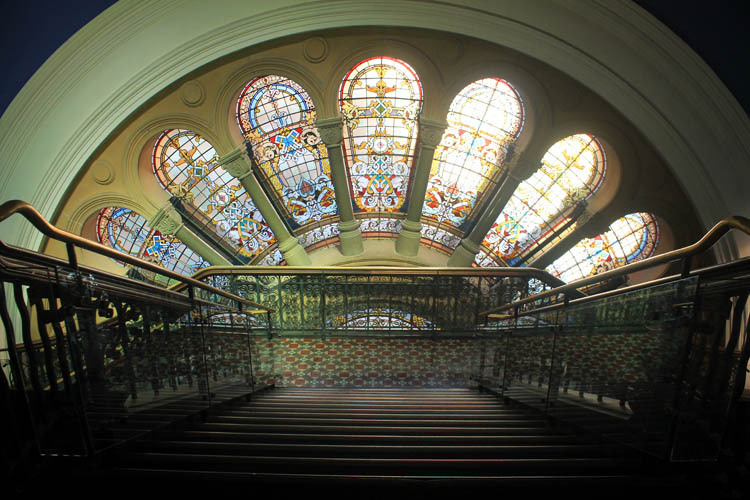 Malls don’t get much more interesting than this — it’s a stylish old building full of stained glass windows and arches. I completely ignored the shops and instead appreciated the architecture. From the Queen Victoria Building I turned down Park Street towards Hyde Park, passing by lots of historic buildings. Hyde Park itself is nice place to walk and the many trees offer shade to the heat stricken. I had a quick look at the ANZAC memorial (which pays tribute to Australian soldiers) and then caught a glimpse of St Mary’s Cathedral. I was just in time to have a look inside before mass started. 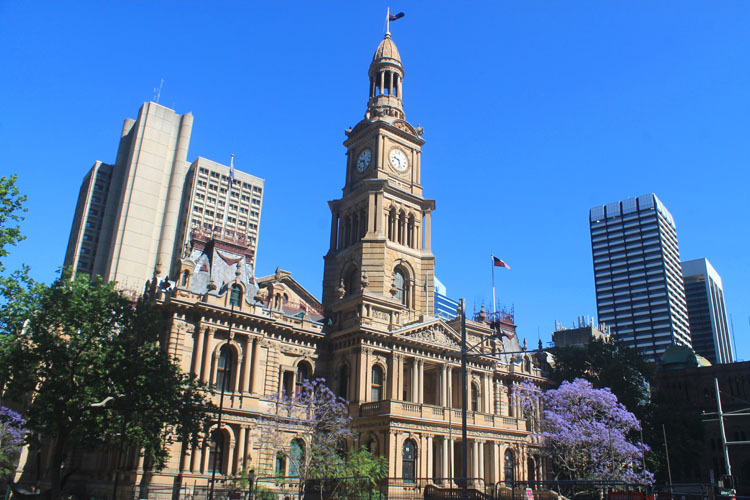 One of the city’s oldest streets, Macquarie street is a must-see for anyone exploring central Sydney. 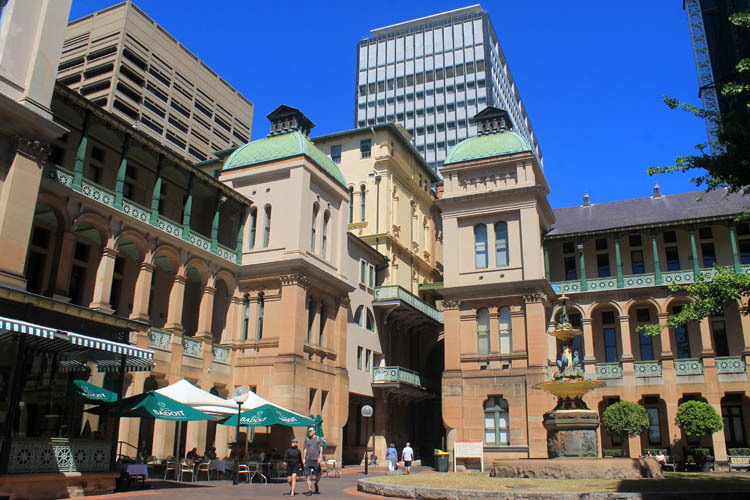 There are heaps of colonial buildings lining the road, including the old mint, Hyde Park Barracks and Sydney Hospital. 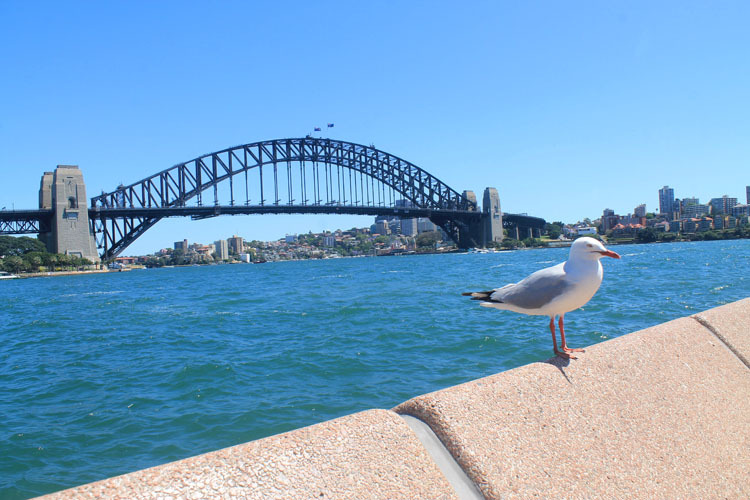 It’s a fascinating area to walk through, and at the end of the road you’ll find Sydney’s most iconic landmarks. 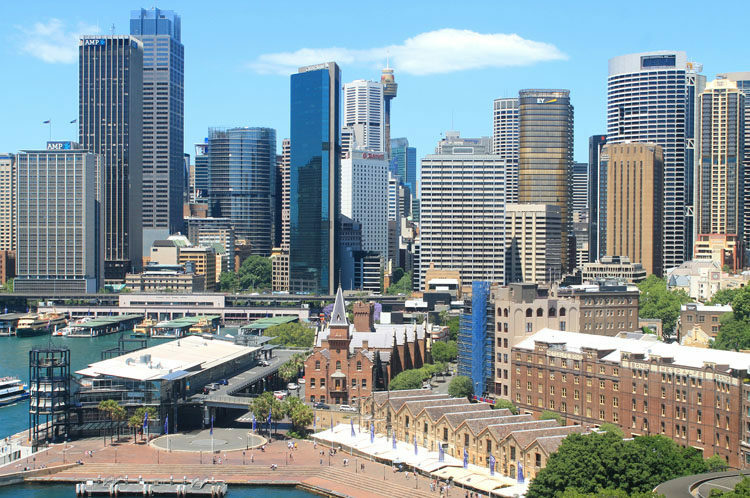 Circular Quay is the place to go if you want to see two of Sydney’s most iconic structures. The Sydney Opera House is kind of hard to grasp up close though, so you’ll want to head up to the bridge or to Mrs Macquarie’s Chair for a better view (more on that later). The Harbour Bridge dominates Circular Quay — you’d have to be a bit of a travel hipster to consider avoiding it on your first trip to Sydney. 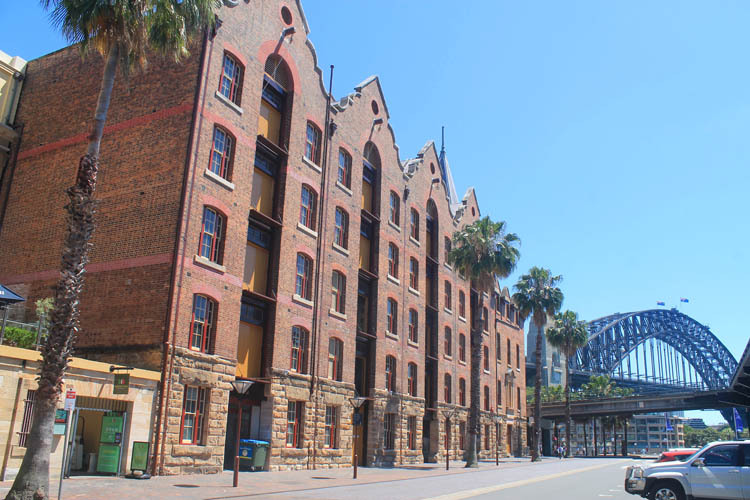 The Rocks, just behind Circular Quay, is home to some of Sydney’s oldest surviving buildings. It’s a cool little area full of cafes, bars and restaurants. There are also markets every weekend which are worth checking out. 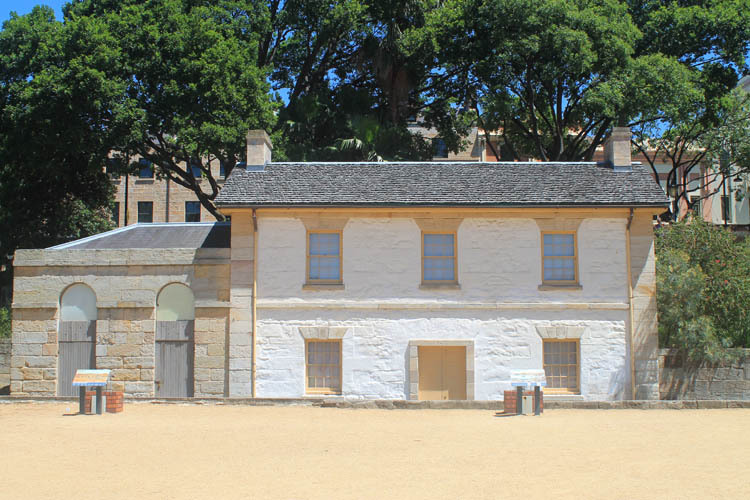 Points of interest in this part of the city include Cadmans Cottage, the oldest surviving house in Sydney (built in 1816) and a row of massive warehouses. 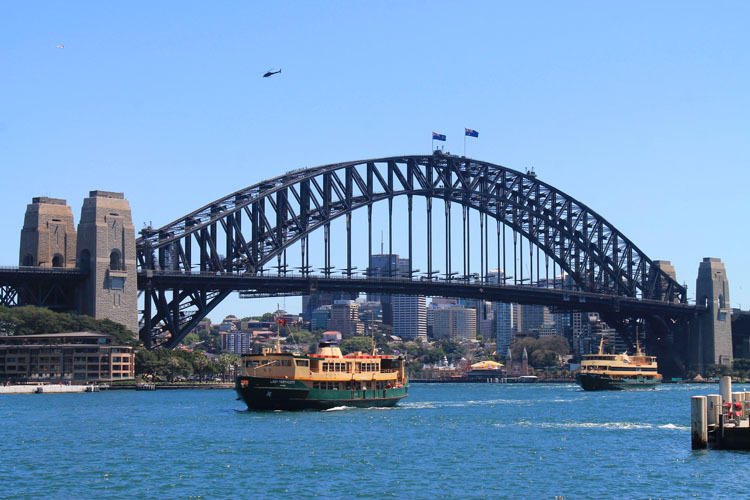 The Sydney Harbour Bridge is nearby and it’s a good idea to walk along it. 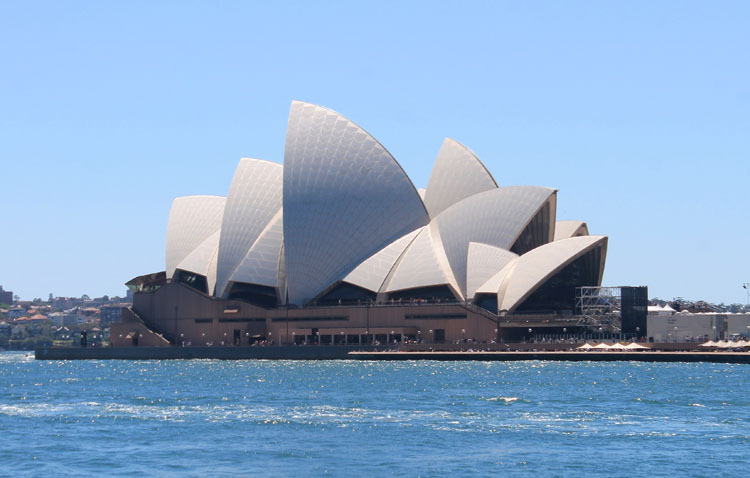 The views of the harbour, the Opera House and the Rocks make it a must-do when spending the day in Sydney. This set of gardens close to Circular Quay is the perfect spot to get some shade on a hot day in Sydney. 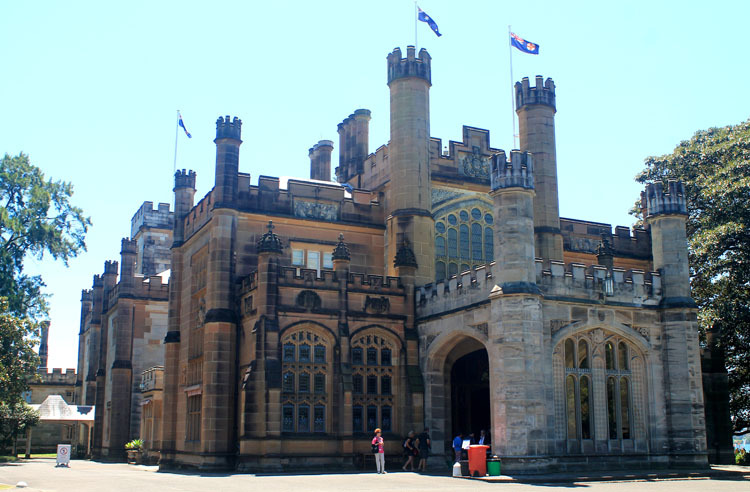 The castle-esque Government House is one of the highlights of the gardens while Mrs Macquarie’s Chair, a short walk around the bay located within the gardens, is a good spot to see the Harbour Bridge and the Opera House. This was the final stop on my little “Day in Sydney” tour — from there I walked back to Park Street, ate some lunch and then took the train back to the airport (getting off at Wolli Creek of course). 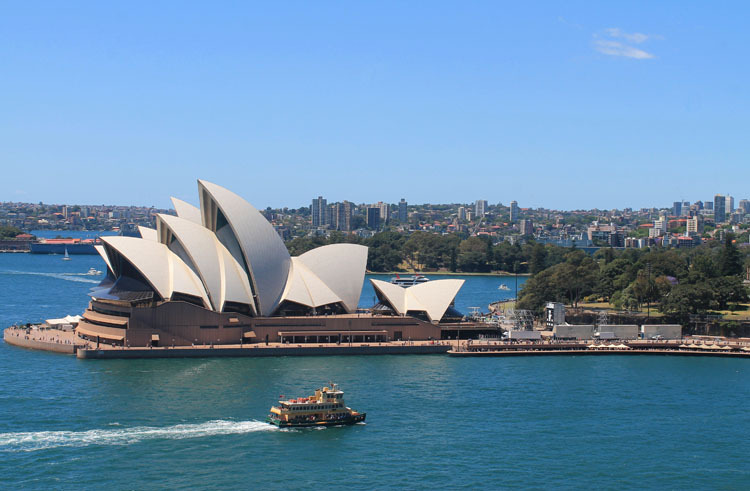 A layover in Sydney doesn’t need to break the bank — I did it for $24, which included a croissant for breakfast and a Big Mac Combo for lunch (cultural, I know). I was going to get Hungry Jack’s, just to see what Burger King tastes like when it has a different name, but the lines were too long. Getting from Wolli Creek Station to Town Hall only takes around 20 minutes, so even if you have less than 12 hours you could still head into the city. 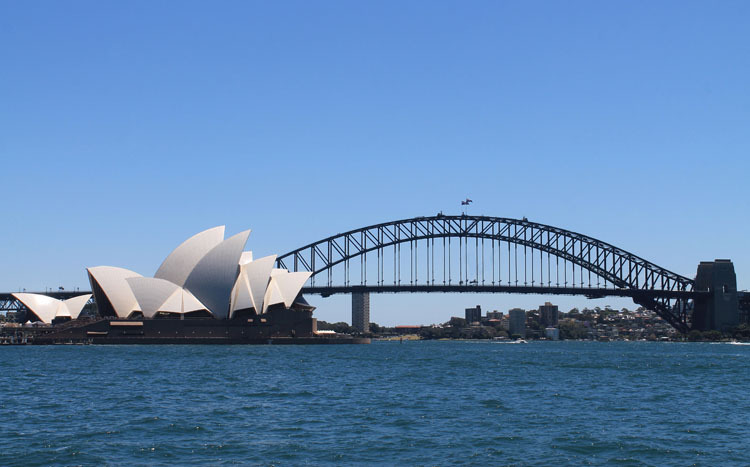 What would you do if you only had a day in Sydney? Let me know in the comments below!